The Doctor Stand-Eze Anti-Fatigue Work Mat offers an attractive smooth marbleized surface and non-porous encapsulated construction that cleans up easily with most disinfecting agents, meeting the challenge of laboratory and medical environments. Doctor Stand-Eze is ergonomically designed to stimulate blood flow and prevent fatigue. This standing mat for an office environment displays excellent physical properties such as tensile strengh, tear resistance and clean ability. 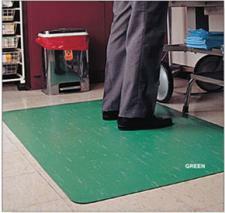 Doctor Stand-Eze Anti-Fatigue mats are available in two styles. The single sponge style is 1/2" thick and the double sponge is a full 7/8" thick, double the thickness of ordinary mats. The base is sealed in a non-porous envelope that is permanently bonded to the backside. Three year unconditional, non-prorated warranty insures against cracking or fracturing. The Doctor Stand-Eze mat is a marbelized smooth top anti-fatigue mat that is easy to clean with most disinfectants making it an ideal choice for laboratories and medical facilities. Custom cuts available in 3' widths up to 20' long. Please call 1-800-810-7847 or email service@commercialmatsandrubber.com for custom size pricing.